The algorithms combines detection and tracking of line segments at the edges of the road or on the road (e.g., lane dividers), and texture analysis to distinguish the road region from its surroundings. One strength of this algorithm is that it requires no training. No need to drive your robot on many roads to learn about the appearance of roads. The flipside of this, of course, is that driving on roads which do not look like standard roads or trails may fail. The algorithm outputs the horizontal coordinate of the vanishing point of the road, which usually is a good indication of the road heading (except in very tight bends or corners). Detected line segments are shown in black and white, while segments that have been reliably tracked over multiple frames are shown in thick purple. Estimated vanishing point location and confidence is shown as a big green disk on the horizon line. 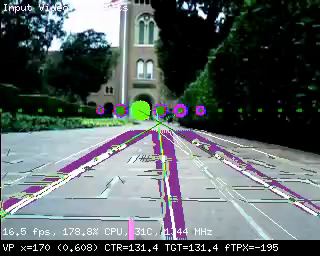 Note that the demo display runs much slower than the algorithm with no video output (which should be used on autonomous cars), simply because drawing all the detected line segments takes a lot of time. This module can send standardized serial messages as described in Standardized serial messages formatting. One 1D message is issued on every video frame for the vanishing point's horizontal location. To casually try out this module, just search the web for pictures of roads and point the JeVois camera to one of them. Make sure that you align the horizon line of the algorithm (which has a number of purple and green disks) roughly with the horizon line in your picture. As you move the camera left and right, the location of the large green disk that marks the detected vanishing point should move left and right, and should point to the vanishing point of the road in your image. When using on a mobile robot in the real world, setting the proper horizon line is essential for good operation of the algorithm. This is determined by parameter horizon, which should be tuned according to the height and tilt angle of the JeVois camera on your vehicle.